IMEX made several battlesets, which naturally used their existing sets of 1/72 plastic figures plus some extras like a base. IMEX also took over Accurate, and for a while they also made some Airfix sets under licence, so some of these figures were also included in their battlesets. These individual sets can be found on our IMEX, Accurate and Airfix listing pages, so these pages are simply a guide to which set is to be found in which battleset, and with what extras. Note however that IMEX sometimes change the contents of their boxes, so the details below are only as complete as we know. Click on the name of the figure set to see more details and our review of that product. This contains one full set of Union Artillery and one full set of Confederate Artillery. 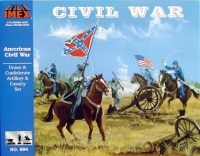 This contains one full set of Union Cavalry and one full set of Confederate Cavalry. This contains one full set of Union Infantry and one full set of Confederate Infantry. This contains one full set of Union Artillery, one full set of Union Cavalry, one full set of Confederate Artillery and one full set of Confederate Cavalry. This contains one full set of Union Artillery, one full set of Union Cavalry, one full set of Union Infantry, one full set of Confederate Artillery, one full set of Confederate Cavalry and one full set of Confederate Infantry. A vacuform diorama base is also part of this set. 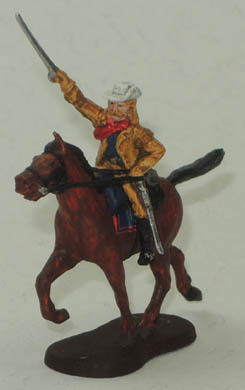 This contains one full set of Union Cavalry but with the Custer figure described in the review and shown below (unpainted, of course), and one full set of Confederate Cavalry done in blue plastic. The opposition is provided by four full sets of Sioux Indians. A vacuform diorama base is also part of this set. This contains vacuform pieces to construct a fort along with one full set of Union Infantry and one full set of Union Cavalry. The opposition is provided by two full sets of Sioux Indians, probably upset at having a fort named 'Apache' on their territory. This contains two full sets of Accurate American Militia and one full set of IMEX George Washington's Army. Their opponents are two full sets of Accurate British Infantry and one full set of IMEX British Redcoats. A vacuform base is also included in this set. This set exists in two forms. The original release of the set contained one full set of Accurate American Militia, one full set of IMEX George Washington's Army and one full set of Airfix Washington's Army. The British were one full set of Accurate British Infantry, one full set of IMEX British Redcoats and one full set of Airfix British Grenadiers. However more recent copies of this set dropped the IMEX and Airfix infantry sets and instead contained two full sets of Accurate American Militia and two full sets of Accurate British Infantry, plus a full set each of IMEX British Artillery and IMEX American Artillery. Which you will find in your box will depend on when it was made. However in both versions, a vacuform diorama base was also included (the same one in all IMEX battlesets - see below). This was 510mm long and 250mm wide, and depicts a small river or track down the middle, with gently sloping land on each side. This contains four full sets of Conestoga Wagon, one full set of Chuck Wagon and Prairie Schooner and one full set of American Pioneers. The usual vacuform base is also included in this set. This contains two full sets of United States Army and one full set of Republic of Korea Troops. Facing them from the north are two full sets of North Korean KPA and one full set of Chinese People's Liberation Army. The same vacuform base as in all the sets is also included in this one. This contains one full set of Alamo Defenders surrounded by one full set of Mexican Infantry, one full set of Mexican Cavalry and one full set of Mexican Artillery. 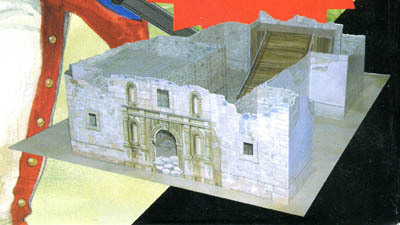 Also included is a very nice pre-coloured cardboard Alamo chapel to assemble (pictured below). Note all the Mexicans in our copy of this set were done in blue plastic. After that IMEX lost interest in battlesets, and in time in figures generally. The Alamo box promises set 537 Mexican Round Hat Cavalry, but that never saw the light of day, along with many other promised sets which were never made. In the spirit of making the most of what you have, IMEX could have produced other sets from their figure range. Examples could have included 'First Thanksgiving' with their Pilgrims and Eastern Friendly Indians perhaps, or 'D-Day' with their US Paratroopers and German Troops sets. Those battlesets that did get made generally offered nothing much beyond the figure sets that they contained, plus the one vacuform base in many cases. The Custer set was particularly appealing as it was the only source of the very nice Custer figure, but later that became available in the single set as well. The Apache fort and the Alamo chapel were the only significant extras, so the main reason to buy any of these was the generally very nice IMEX figures themselves (and certainly not the often poor box artwork).